Finally! I finally found a couple of Indian head pennies. Its been driving me crazy not finding any in parks and places where they should be. Here’s the trick, both rang up as 1-30, 1-31 at 5+ inches deep. I’ve been told and have read they should ring up in the ball park of 12-35 to 12-39. Not on channel 6 and deep. Keep in mind other numbers came up as I swept back and forth, but those to sets of numbers came up the most. I also hit another Merc and War Nickel. 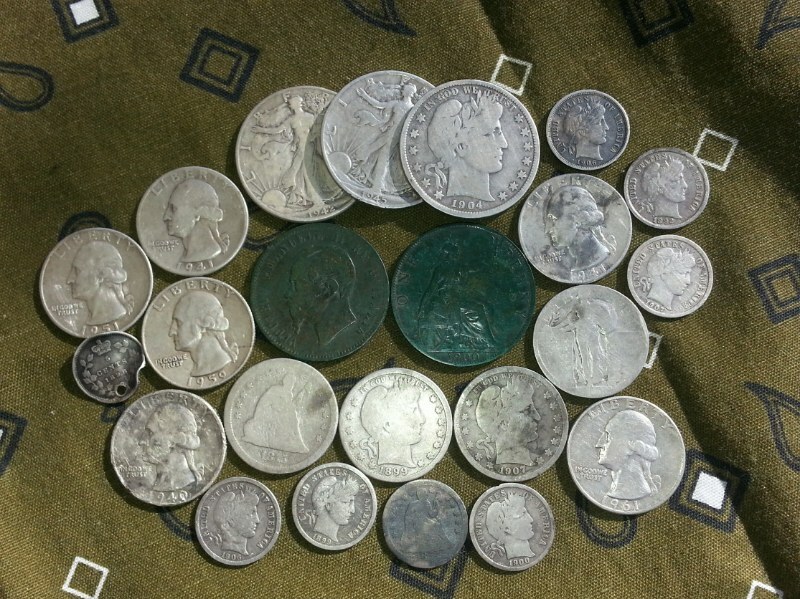 I’m at 56 silver coins this year, can I hit 100? I’m dang sure going to try. Keep pounding those old parks, not always in the obvious areas. If you ever wondered if some coins are just deeper or is any left? The answer is yes! I’ve been having surprisingly good luck hunting old parks here lately. For quite a while I was told old parks were hunted out, not so much so. Everything I’ve been finding is between 6-9″ deep, I know most people don’t think it’s possible. It is very possible, but you must learn your machine and figure out how it responds to deeper targets. As you work your way around detecting watch for deeper targets. If nails and bottle caps can get 6+ inches deep, so can coins. Deep coins WILL NOT be dead on the numbers, but they will be close enough to know its a coin. Yes, I still did nails and other trash, but a whole lot less than I used to. I hope I’ve encouraged some to stick with hunting older parks and seek out those deeper targets. On a side note, I dug up an 1862, 10 Centesimi Italian bronze coin. Pretty cool coming from an old park dating to 1911. I can only believe someone emigrated here bringing the heirloom only to drop it in this park.